An informational meeting will be held on Wednesday, March 20th at 5:30 p.m. in the MJHS cafeteria for parents of 6th, 7th, & 8th graders who are interested participating in track this year. 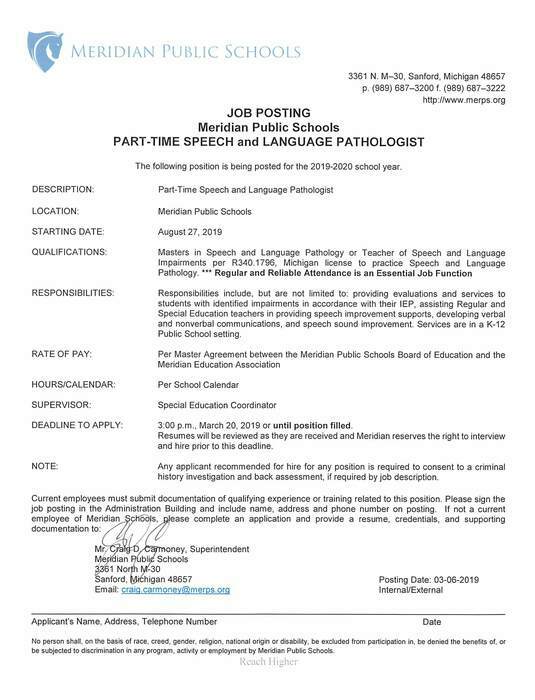 The Meridian Public School District is seeking applications for the current vacant position on the Board of Education. An individual will be appointed to fill the vacant position until the November 3, 2020 election. Interested persons are to submit a letter expressing interest along with their qualifications for the position, no later than 3:00 p.m. on March 11, 2019 to: Meridian Administration office, Attn: Board President Bowen, 3361 North M-30, Sanford, MI 48657 or to board@merps.org. Following a review of the submitted materials, the board will schedule interviews with interested candidates at their March 18, 2019 meeting. If you have any questions concerning the role of the Board of Education and the responsibilities of a Board Member, please contact Craig D. Carmoney, Superintendent of Schools, at (989) 687-3200. 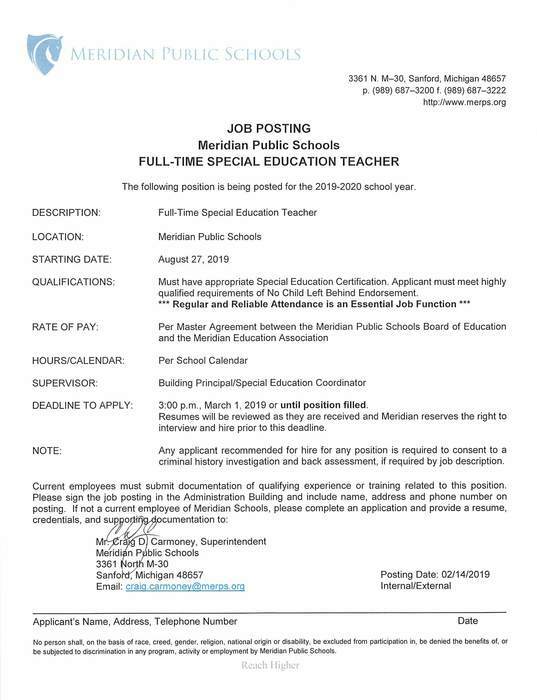 Notice of Board Vacancy The Meridian Public School District is seeking applications for the current vacant position on the Board of Education. An individual will be appointed to fill the vacant position until the November 3, 2020 election. 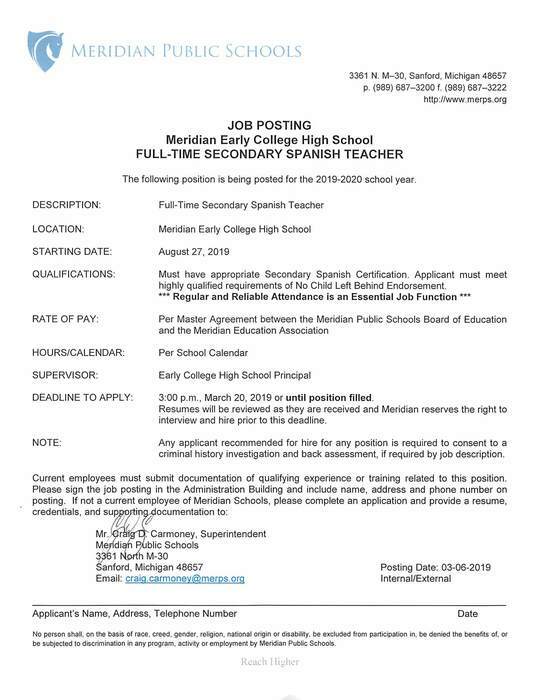 Interested persons are to submit a letter expressing interest along with their qualifications for the position, no later than 3:00 p.m. on March 11, 2019 to: Meridian Administration office Attn: Board President Bowen 3361 North M-30 Sanford, MI 48657 Or at board@merps.org Following a review of the submitted materials, the board will schedule interviews with interested candidates at their March 18, 2019 meeting. If you have any questions concerning the role of the Board of Education and the responsibilities of a Board Member, please contact Craig D. Carmoney, Superintendent of Schools, at (989) 687-3200. Jazz band has been canceled for today. Students were told this morning, and a few of them have been trying to call their parents to notify them. I was just informed however, that we are currently having problems with our phones and we are not able to call outside the district. 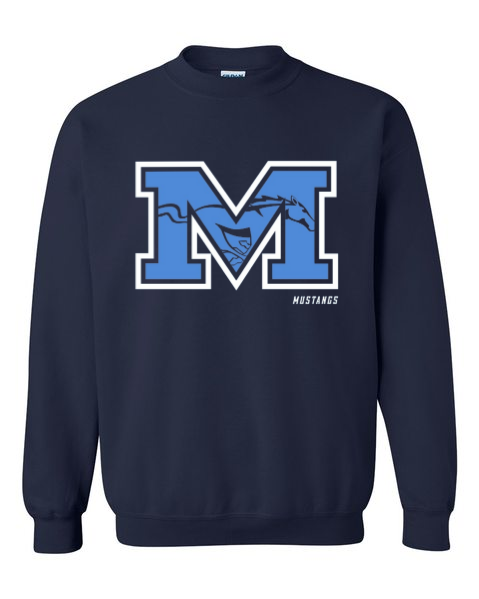 Parents, please take our annual MJHS Parent Perception Survey by going to the 'News' on the MJHS web page. Meridian is hiring! We are looking for a full time special education teacher for the 2019-2020 school year! See the attached job posting for more information. You can find the employment application and contact information on our website at www.merps.org under Human Resources. 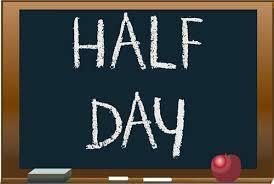 Friday, February 22nd is a half day of school, and MJHS students will be dismissed at 11:15 a.m. The 7th & 8th grade boys' basketball games originally scheduled for February 25th have been moved to Tuesday, February 26th. The games are still in Clare and will start at 5:00 p.m.
MJHS Parent/Teacher Conferences are on Wednesday, February 20th from 4:00 - 7:30 p.m. Appointments are not necessary since conferences at MJHS are on a drop-in basis. Today's MJHS basketball games have been rescheduled for tomorrow, Thursday, February 14th. Games start at 5:00 p.m. The 8th grade play at home, and the 7th graders travel to Beaverton. Meridian Public Schools will be again on Wednesday, February 13th. Many of the roads that were plowed yesterday have drifted back shut. Meridian Public Schools will be closed on Tuesday, February 12th as conditions are expected to deteriorate throughout the morning hours. 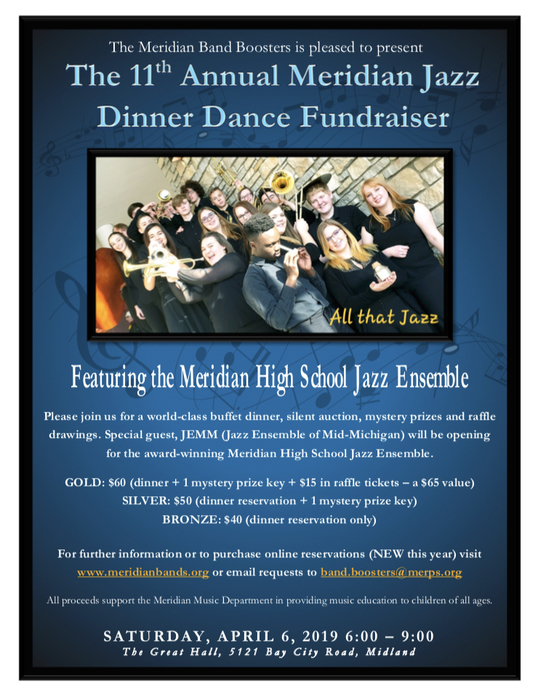 The MJHS February newsletter is now available in the MJHS web site. Go to 'Documents' under the 'Menu' link. The 7th grade basketball games for tonight, February 5th have been cancelled. We are very sorry, but MJHS just learned that Harrison had a mix-up and did not send their team to Meridian. All evening activities have been CANCELLED for tonight. Please stay safe and warm. All athletic events and practices have been CANCELLED for today. Please stay safe. Monday's games against Beaverton have been rescheduled for Tuesday, January 22nd @ 5:00 p.m. 7th Grade will play at HOME, and 8th grade will play at Beaverton. The Jr. High Boys' Basketball games against Beaverton have been canceled for tonight, Monday, January 21st due to Beaverton schools being closed today. The 8th Grade team will practice from 3:00 - 4:30 p.m. and the 7th Grade team will practice from 6:00 - 7:30 p.m.
Friday, January 18th is a half day of school, and MJHS students will be dismissed at 11:15 a.m. The 7th Grade Boys' Basketball team will start practice Wednesday, January 2nd from 6:00 - 7:30 p.m. The 8th Grade Boys' Basketball team practice had to be canceled for January 2nd, so practices for the 8th grade team will start on Thursday, January 3rd from 3:00 - 4: 30 p.m.
A Fun Night for MJHS 5th & 6th graders will be held from 3:00-4:30 p.m. on Wednesday, December 19th. A hot cocoa bar, a popcorn bar, and many activities will be offered. Tickets are on sale now during breakfast and lunch. Pre-sale tickets are $6.00 each and $7.00 at the door. A dance for MJHS 7th & 8th graders will be held from 6:00 - 7:30 p.m. on Wednesday, December 19th. Tickets are now on sale during breakfast and lunch. Pre-sale tickets are $6.00 each and $7.00 at the door. Friday, December 7th is a half day of school, and MJHS students will be dismissed at 11:15 a.m.
Wednesday, November 21st is a half day of school, and MJHS students will be dismissed at 11:15 a.m. Have a Happy Thanksgiving! All girls basketball practices at the High School have been cancelled. All Junior High practices have also been cancelled. All junior high practices have been cancelled for this evening. With this Friday marking the end of the First Marking Period, MJHS will host Parent/Teacher Conferences on Thursday, November 8th from 12:00 - 3:00 p.m. and 4:30 - 8:00 p.m. Conferences at MJHS are on a drop-in basis. This Friday, October 26, 2018 is a half day of school and MJHS students will be dismissed at 11:15 a.m. The first MJHS newsletter of the year is now available in the MJHS web site. Go to 'Documents' under the 'Menu' link. MJHS students and their families are invited to attend a night of fun at the 2nd annual MJHS Fall Family Night on Wed., Oct. 10th from 6 - 8 p.m. Pre-sale tickets for students are $8.00 each and $10.00 at the door. Adults are free. Tickets are sold each day during lunch. Picture Retake Day at MJHS is Wednesday, October 3rd. Reminder: Picture Day at MJHS is on Thursday, September 13th. Students received flyers describing purchasing options last week. The cross country meet scheduled for today (Sept. 5th) in Shepherd has been cancelled and rescheduled for tomorrow (Thursday, Sept. 6th)​. Practice is now scheduled to go on for this afternoon but another announcement will go out if storms cause us to cancel that too. MJHS Schedule--Meridian Jr. High's doors unlock at 7:30 a.m., breakfast starts at 7:40 a.m., and classes start at 8:00 a.m. Please do not drop students off prior to 7:30 a.m. Although the 5th grade orientation will not be rescheduled, mentors will be on hand to help 5th graders open their lockers Tuesday night from 4 to 7 p.m. MJHS staff and student mentors are also planning on working with 5th graders on opening day to help them adapt to MJHS. The fire alarm is fixed and schedules will now be handed out Tuesday night from 4 to 7 p.m. Teachers will be available to meet from 5 to 7 p.m., and the 5th grade parent meeting will still occur at 6 p.m.
7th and 8th grade volleyball practice for today, August 27th has been moved to Meridian Elementary School. 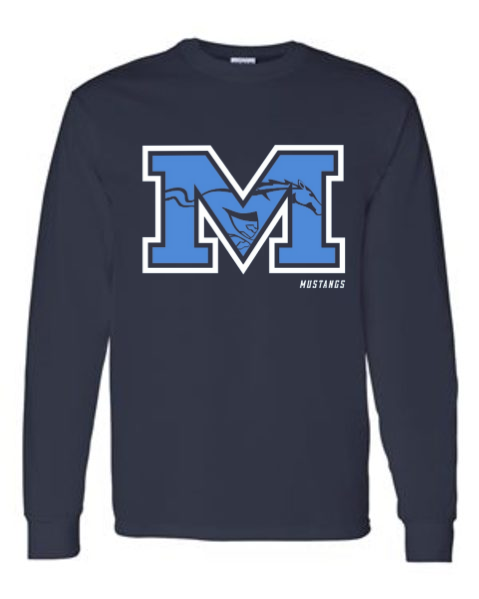 Practice will still be held from 3:00 to 4:30 p.m.
Due to a lightning strike, MJHS's fire alarm is not functional, and students are not allowed in the building. Schedules will still be distributed from 1 to 3:30 p.m. today just outside the main entrance, but unfortunately students will not be able to get to their locker. 5th grade orientation has been cancelled due to a power outage. Fifth graders joining band and their parents are invited to attend the 5th Grade Band Parent Meeting on Thursday, September 6th at 7 p.m. in the MJHS cafeteria. Representatives from Marshall Music will be on hand to rent and sell instruments as well as to answer questions. 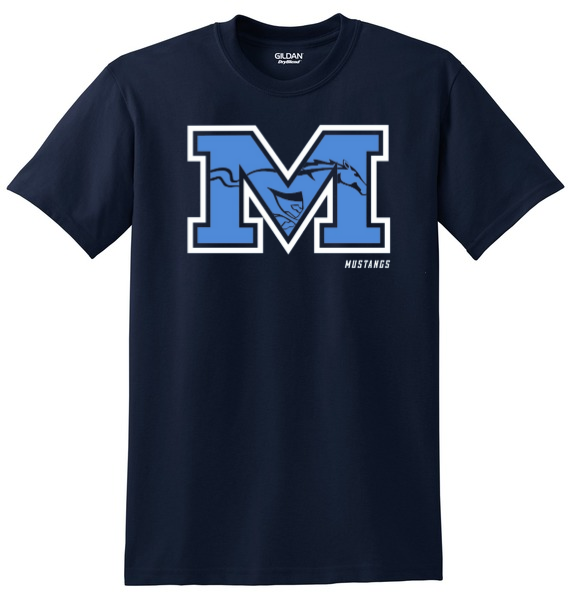 Schedule pick-up for all MJHS students will take place on Monday, August 27th from 1:00 p.m. - 3:30 p.m. and on Tuesday, August 28th from 5:00 - 7:00 p.m. Tuesday's scheduled time is part of the Welcome Back Open House. This year’s Meridian Jr. High Orientation for 5th graders and new 6th, 7th, & 8th grade students to the district will be Monday, August 27th. 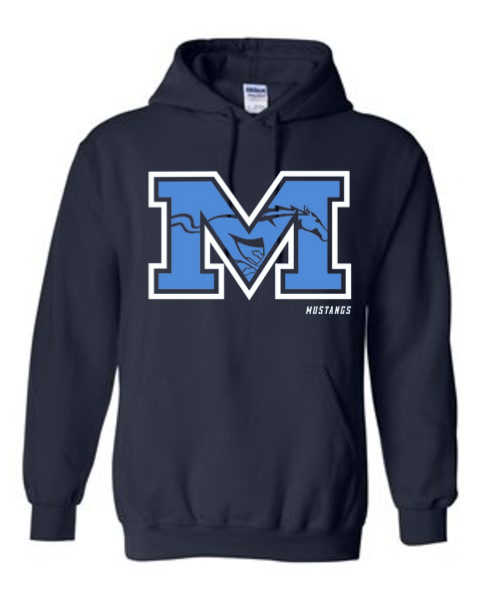 Orientation will start in the Meridian Jr. High gym at 10:00 a.m. and will last until 1:00 p.m.
7th and 8th grade volleyball practice will be held Monday August 27 through Wednesday August 29 from 3:00-4:45 pm in the JH. You must have a sports physical to participate, and a player fee of $30 will be charged before the first game is played. The first day of school is Tuesday, September 4th. The day will start at MJHS with breakfast at 7:40 a.m., and classes start at 8:00 a.m.